Once your braces are removed, retention is critical and requires you to wear a retainer. You’re probably wondering after having orthodontic treatment, why you have to wear a retainer at all? Simply put, its because if you don’t wear one, your teeth will start moving right back to where they were. After they have been moved, you should allow time for your periodontal ligament to adjust to the new position. There are several types of retainers available, all of which are custom-made just for you! The most common retainer being the “Hawley” retainer – a thin, tongue-shaped piece of acrylic molded to fit your mouth, with a wire to hold your teeth in place. This design is simple, durable, and easily removed. 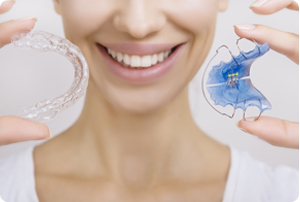 Another popular style of retainer is the clear aligner-type, which looks similar to the Invisalign tray system. These retainers are custom-made of thin, transparent plastic which is designed to to be a precise fit to your teeth. Encourage the discrete nature of this retainer with no wire and invisibility. Although not recommended for all conditions, Dr. Shafer will help you find the best fit for your smile! Fixed retainers are an excellent option for some patients, especially on the lower front teeth. The aren’t removable, but they aren’t visible to you either. This retainer uses a wire to bond the tongue side of the teeth. Although treatment time is longer, fixed retainers may be good for you if you have a high risk of your teeth reverting to their former position. After a short time, most people adjust very well to wearing a retainer. You may find that you produce more saliva than usual for a day or so after first wearing your retainer — this is a normal reaction to a foreign object in the mouth. You may also find it a little harder to talk normally at first, but that problem will soon disappear. Of course, removable retainers should always be taken out when you eat or brush your teeth — a big change from braces! Finally, remember to always carry — and use — a retainer case. You’d be surprised how many retainers end up folded in a napkin and accidentally discarded! Also, don’t expose your retainer to excess heat by washing it in very hot water or leaving it on a heater: That can cause your retainer to warp and make it unusable. With proper care and conscientious use, a retainer can help you transition from braces to a permanent, healthy smile.